I quit eating pasta years ago, but that didn't put a stop to my love for marinara sauce or Alfredo sauce. I will sometimes east these sauces over spaghetti squash strands, but my favorite way to enjoy them is over spiral-sliced zucchini. With my lack of patience for hand-crank spiralizers and passion for innovative kitchen gadgets, I was super-excited when the Gourmia team offered me an opportunity to review their new Electric Spiralizer, the Curly Q Pro. 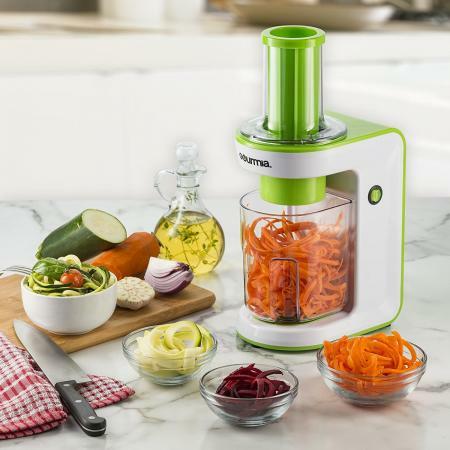 If you are a fan of spiral-sliced vegetables or if you're looking for more ways to include veggies in your family's diet, then Gourmia's Spiralizer is a must-have for your kitchen. Most available spiralizer tools for the kitchen are manual slicers, so they are more time-consuming and messy to use. That is not the case with this compact kitchen tool. Instead, it is simple to use and makes easy work of cutting fresh vegetables into spirals for you and your family to enjoy. The spirals you create with this powerful kitchen tool can be used to replace pasta in many recipes, or served on their own as unique and attractive side dishes or garnishes. I love using it to create zucchini noodles, but it also works well with carrots, cucumbers, beetroot, summer squash, sweet potatoes and regular potatoes. To use the spiralizer, you simply place the included bowl in the base of the unit and insert the selected blades. It comes with three blades, each of which results in a different size spiral. One blade cuts veggies into ribbons, one creates thick 'noodles' (fettucini sized) and one creates thin 'noodles; (spaghetti sized). The blade needs to be placed in the top of the base, and then you simply run them through the machine using the included pushing tube. In just a few seconds, you'll have a bowl full of lovely spirals ready for you to cook or serve with no mess on the counter. Check out this demonstration (below) from the Gourmia's You Tube channel to see the slicer in action. This small appliance comes apart as easily as it goes together, so you can disassemble it in just a few second for washing. All parts except for the base (which has the power cord attached) are safe for the dishwasher. The base can easily be wiped clean after each use. The unit weights less than four pounds and is relatively small, measuring 7" long x 6" wide x 12" tall when fully assembled. Due to its compact size, it's easy to find a storage spot for this gadget in just about any kitchen. Disassembled, it will easily fit on any kitchen cabinet shelf. I have mind stored inside a door on my microwave cart. Of course, if you have counter space available and plan to use your spiralizer often, you may just want to keep it out all the time. It comes in three colors (white, green and black), so it'll be easy to find one that coordinates with your kitchen decor. It is very simple to cook spiralized vegetables. A recipe book is included in the package, with instructions for a variety of yummy dishes, like breakfast hash made with sweet potato noodles (yum!). You can also find plenty of spiralized veggie recipes online, including instructions for cooking zucchini spirals and sweet potato ribbons. Plus, don't lose sight of the fact that you can enjoy many spiral-sliced vegetables in their uncooked form. They are great additions to any fresh salad or fresh vegetable tray, and they also make beautiful garnishes when presentation is key! You definitely won't be disappointed with how easy this gadget is to use, as well as the way in which it can expand your recipe repertoire! Disclaimer: The author received this product at no cost in order to review it. The opinions presented here are her own.